Originally thought to be an introduced species by Indonesian seafarers some 3000 years ago, modern archaeological evidence now indicates that the Australian Dingo’s origins are in fact natural and far older than originally supposed. A study conducted by scientists from The Royal Society (UK) reveals that the dingo has occupied Australia for up to 18000 years, having migrated naturally from central Asia across land bridges during the last ice age (Pleistocene Epoch 18000BP). Published in the journal Proceedings of the Royal Society B, the study took mitochondrial DNA samples from more than 900 domestic dogs across Asia including south China, southeast Asia, Indonesia, New Guinea, the Philippines and Taiwan, as well as pre-European samples from Polynesia and the Australian dingo. Genetic comparisons revealed that domestic dogs came from southern China over 10,000 years ago and arrived with Polynesia's first people 3000 years ago. 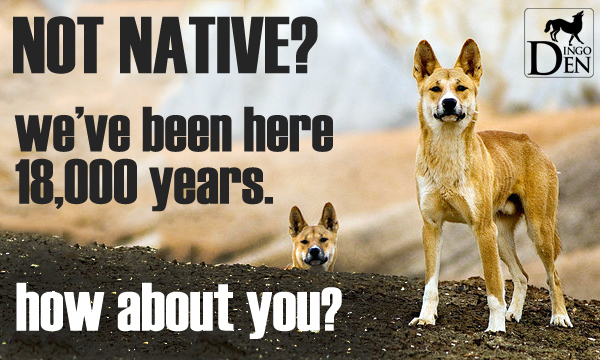 The Australian dingo, however, along with the closely-related New Guinea Singing Dog, took a separate route much earlier that led them to Australia and New Guinea around 18,000 years ago. "Clearly, the land route is much more feasible for dogs than the sea route," says Dr Alan Wilton, a geneticist from the University of NSW, Sydney, and one of the researchers involved in the study. "This is huge for the dingo. This study really confirms an enigma which has been with us all the time: where did the animal come from, or more specifically, how did it get here?" says Lyn Watson, co-founder of the Dingo Discovery Sanctuary and Research Centre near Melbourne. "We never really bought the story that it came by boat." Disputed as an introduced species for many years, this study solidifies that the Dingo is in fact a native Australian mammal, having migrated to the country naturally over 18000 years ago. Details of The Royal Society’s study can be found ﻿here﻿. This is huge for the dingo. This study really confirms an enigma which has been with us all the time: where did the animal come from, or more specifically, how did it get here? We never really bought the story that it came by boat. 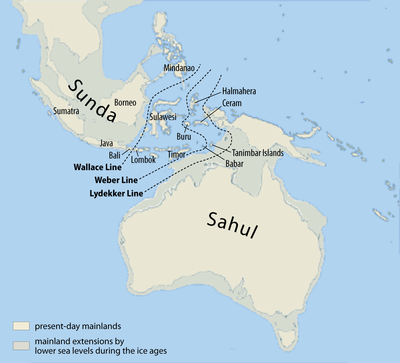 The land masses of Sahul and Sundana during the Last Glacial Period (Pleistocene Epoch), 18000BP. Due to lower sea levels Australia, New Guinea, and Tasmania were one land mass.